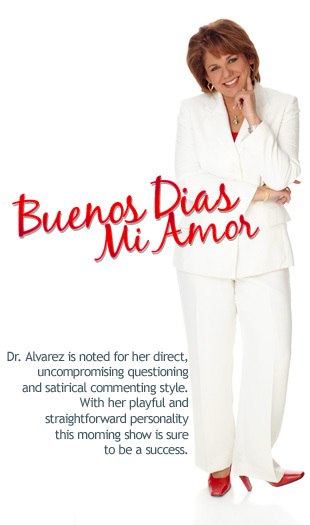 Dr. Alvarez is noted for her direct, uncompro­mising questioning and satirical commenting style. With her playful and straightforward personality this morning show is sure to be a success. Dr. Janet Alvarez-Gonzalez began her career in Richmond Vir­ginia as producer, and political reporter for PBS and Jay Sears News Services interviewing personalities such as President Mikhail Gorbachev, Lieutenant Colonel Oliver North, Vice-President Al Gore, Senator George Allan, Governor Douglas Wilder, as well others international personalities. Dr. Alvarez received a Bachelor in Psychology from the Virginia Commonwealth University in 1990. Continuing her studies, Janet attended Virginia State University where she received a Masters in Educational Media in 1992. In 2009 she culminated a Ph.D. in Business Administration in Marketing and a Post Graduate Certificate in International Business from Argosy University. She has taught Journalism, Mass Communications and Marketing at many universities around the world including Universidad de Québec in Montreal, Virginia State and University of Puerto Rico, Universidad Catolica Boliviana, and The Puerto Rico State Guard Military Institute. In addition she was the Dean of the MBA Center at Columbia University in Puerto Rico. She has worked as an investigative reporter, marketing strate­gist, and executive producer for many International Television Networks including FOX, PBS, Univision, Red Pat, Teletica, Radio Puerto Rico, and the National Radio Network. In 2003, she wrote, directed, produced and performed in the film “Latín Comedy” a social satire about how Hispanics were manipulated by the media. In 2004, Janet Alvarez established the radio show “Quejate y te lo Resolvemos” on prime time at Radio Puerto Rico Network and the National Radio Network. In this show the microphones were opened to the audience to denounce acts of injustice, corrup­tion, and poor services of the government and state agencies of Puerto Rico. After receiving each complaint, Alvarez called the offenders directly and confronted them on-air. In this radio show Janet Alvarez, (known as The Peoples Attorney) demonstrated out­standing community service involvement, helping to resolve cases for the underserved populations of the island of Puerto Rico and the Dominican Republic. In 2008 she transferred from the National Guard in Puerto Rico to the Texas Military Forces. She was appointed as MAJOR where she served as a Public Affairs Officer. On October 15, 2010 she completed her military tour, and received her Honorable Dis­charge and the Medal of Merit for “her extraordinary service for the State of Texas”. She is co-starring in the movie “Crisanto” a Mexican film being released in June 2011. Currently she is producing the film "El Secreto del Retrato"
The distinctive stamp and prestige of Dr. Janet Alvarez offers the assurance of achieving a resounding success with the Texan Hispanic market.